Oak Grove is an inclusive congregation that seeks to follow Jesus, wherever the Spirit leads. Our roots go back more than 150 years even as we welcome a new understanding of today that comes through growth and change. Extra parking for Sunday services is available at Washburn-McReavy, at Penn Place Apartments just north of our lower lot, and at the tan brick apartment building on the west side of Penn across from the lower lot. email us at ogpc@oakgrv.org and type “Join Contact List” in the subject line. 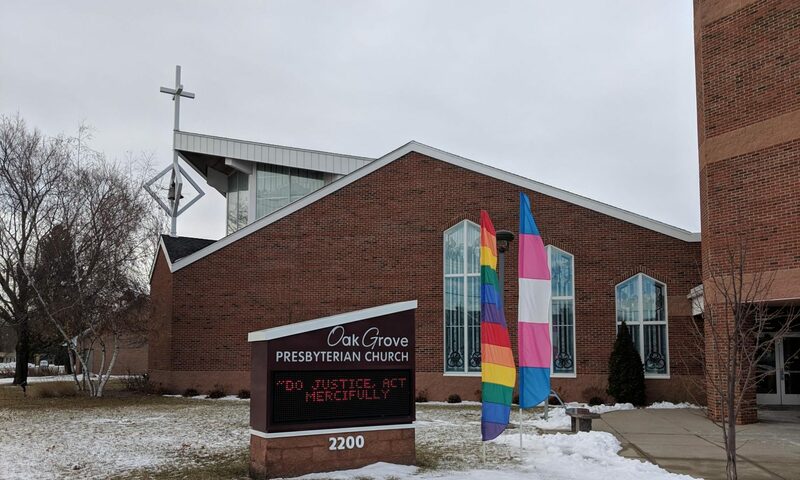 Oak Grove Presbyterian Church of Bloomington, Minnesota, has a rich history that extends over 150 years. This history began, interestingly enough, in Washington, Connecticut. It was there during a series of religious revival meetings in 1831 that two young brothers, Samuel and Gideon Pond, were baptized and dedicated their lives to serving Jesus Christ. They set out in the early 1830s in search of a place where they would be Challenged and could be of service to people who needed their love and concern. Divine Providence eventually led them to Fort Snelling (then called Fort St. Peter’s) at the confluence of the Minnesota and Mississippi Rivers. There they began missionary work among the indigenous Dakota people and the early white settlers in what would later become Bloomington, Minnesota. Today, several members of our congregation (including Pastor Bill Chadwick) are descendents of our original church founders.